"The West is provoking a new cold war with Russia"
* Professor Norman Stone: Professor of International Relations and Director of the Russian Centre at Bilkent University, Ankara. * Alexei Pushkov: Anchor of the most popular Russian TV programme “Post Scriptum” which has considerable influence on Russian public perception of international events. 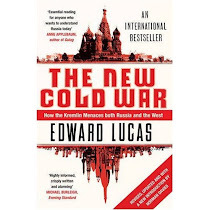 * Edward Lucas: Central and Eastern Europe correspondent for the The Economist and author of The New Cold War: How the Kremlin Menaces Both Russia and the West (2008). * Dr Lilia Shevtsova: Senior Associate of the Carnegie Endowment for International Peace (Washington). ENGLISH is what matters. It has displaced rivals to become the language of diplomacy, of business, of science, of the internet and of world culture. Many more people speak Chinese—but even they, in vast numbers, are trying to learn English. So how did it happen, and why? Robert McCrum’s entertaining book tells the story of the triumph of English—and the way in which the language is now liberated from its original owners. The author’s knack for finding nuggets enriches what might otherwise seem a rather panoramic take on world history from Tacitus to Twitter. Take the beginnings of bilingualism in India, for example, which has stoked the growth of the biggest English-speaking middle class in the new Anglosphere. That stems from a proposal by an English historian, Thomas Macaulay, in 1835, to train a new class of English speakers: “A class of persons, Indian in blood and colour, but English in taste, in opinion, in morals, and in intellect.” At a stroke, notes Mr McCrum, English became the “language of government, education and advancement, at once a symbol of imperial rule as well as of self-improvement”. India’s English-speaking middle class is now one of the engines of that country’s development and a big asset in the race to catch up with China. Bit by bit, English displaced French from diplomacy and German from science. The reason for this was America’s rise and the lasting bonds created by the British empire. But the elastic, forgiving nature of the language itself was another. English allows plenty of sub-variants, from Singlish in Singapore to Estglish in Estonia: the main words are familiar, but plenty of new ones dot the lexicon, along with idiosyncratic grammar and syntax. Mr McCrum hovers over this point, but does not nail it. English as spoken by non-natives is different. The nuanced, idiomatic English of Britons, North Americans, Antipodeans (and Indians) can be hard to understand. Listen to a Korean businessman negotiating with a Pole in English and you will hear the difference: the language is curt, emphatic, stripped-down. Yet within “Globish”, as Mr McCrum neatly names it, hierarchies are developing. Those who can make jokes (or flirt) in Globish score over those who can’t. Expressiveness counts, in personal and professional life. The big shift is towards a universally useful written Globish. Spellchecking and translation software mean that anyone can communicate in comprehensible written English. That skill once required mastery of orthographical codes and subtle syntax acquired over years. The English of e-mail, Twitter and text messaging is becoming far more mutually comprehensible than spoken English, which is fractured by differences in pronunciation, politeness and emphasis. Mr McCrum aptly names the new lingo “a thoroughfare for all thoughts”. Perhaps he should have written that chapter in Globish, to show its strengths—and limitations. English as the international language - that's an urban legend! I live in London and if anyone says to me “everyone speaks English” my answer is “Listen and look around you”. If people in London do not speak English then the whole question of a global language is completely open. The promulgation of English as the world’s “lingua franca” is impractical and linguistically undemocratic. I say this as a native English speaker! Impractical because communication should be for all and not only for an educational or political elite. That is how English is used internationally at the moment. Interesting subject. Obviously known in the region, but in this case legal consquences are more meaningful. Perhaps another factor in an honest discussion about the past in Russia which looks more probable in recent weeks. Without my foreknowledge, I was last year awarded the Bene Merito medal of the Polish Foreign Ministry. Although enormously honoured by this, I have sadly decided that I cannot accept it as it might give rise to at least the appearance of a conflict of interest in my coverage of Poland.